The Sun Dolphin 12 Aruba SS is relatively streamlined for a recreational kayak but offers a good amount of storage space should you want to go on day trips. 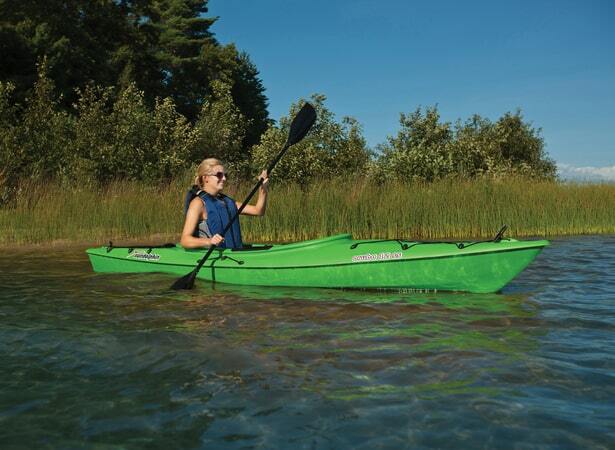 The Aruba 12 SS is a great “Cottage Kayak” in that it behaves best in calmer lake conditions and bodies of water. It’s straight line keel helps with tracking in calmer waters while not compromising manoeuvrability very much. You may have noticed that I have mentioned “calmer waters” twice. Well thats because in rougher conditions the kayak does not handle as well, often it gets pushed around by bigger waves and water tends to flow over the nose of the kayak because it has little rocker on the nose. I would not try to go with your sea kayaking friends with this kayak as you will struggle to keep up. Should you want to paddle the lake for the day the Sun Dolphin Aruba 12 SS has an ample amount of storage space available including a small bow hatch, Rod Holders, ample room in the cockpit and finally the P.A.C. . The P.A.C. or Portable Accessory Carrier is a clever little storage compartment that you can take in and out of the kayak with relative ease. In there you can put things that are meant to be dry like clothes, food, wallet cell phones etc. If you are into lake fishing this kayak may be a good fit for you because of the two featured flush mount rod holders, extra storage room (P.A.C can be taken out to make way for more room) and the tray compartment that is located at the top of the cockpit. The tray can be used for small things like tackle, lines and hooks that are easily accessible. One thing that is overlooked with the Aruba 12 SS is that the seat is lifted from the bottom of the boat. This allows your bum to stay dry while you are paddling around the lake. It’s seat and foot pads are also adjustable to fit people of various sizes. Some complaints over the plastic being a bit flimsy. Similar to many Sun Dolphin boats people either like the Sun Dolphin Aruba 12 SS and other hate it. Most customers that are getting into kayaking seem to like it and the way it handles but more experienced paddlers seem to be less than impressed at times. Most of the common complaints by customers were directed to Sun Dolphin’s shipping and handling. Some customers noticed plastic shards that were in the kayaks while others complained about the flimsy shipping material that these kayaks are shipped in. As a result they arrive with scratches and the odd time even dents in them. Another common theme seemed to be that the waterproof divider would come loose during shipping and cause some problems. One reviewer even went on to say it was the worst Kayak they have touched in 5 years! It’s not all bad though. There were relatively few complaints about the Sun Dolphin Aruba 12 SS on water performance. It’s rating also is not too bad with the majority of them being 4 stars from a wide variety of different customer review sites. A lot of new kayak fisherman enjoyed using this kayak for fishing and loved the extra storage and tackle compartment.